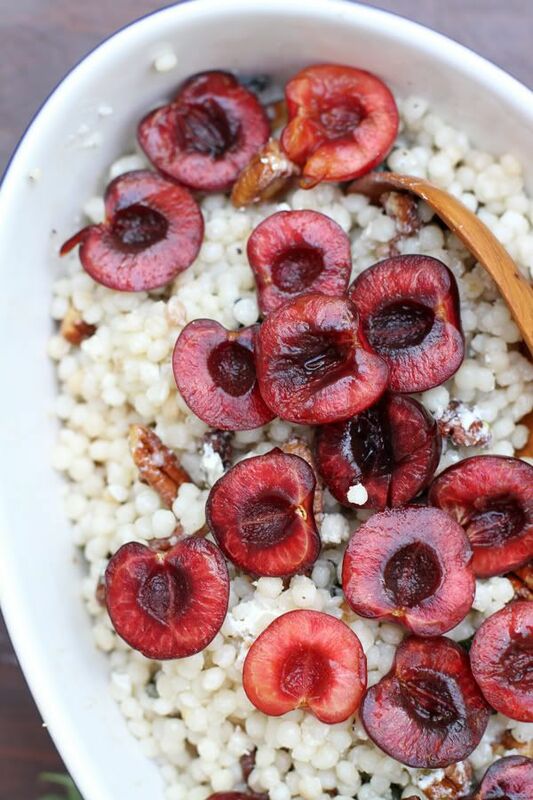 Sweet cherries are so delicious plain that it's hard to keep them around as an ingredient for another, more elaborate dish. I generally eat them by the handful, which is easiest done outside for freedom of pit spitting, but generally I just stand by the garbage can, lid open, spitting away. I just recently reached the point of cherry exhaustion. I thought it would never come, but then it did and the idea of a plain juicy cherry just wasn't as enticing as it had been two weeks ago. 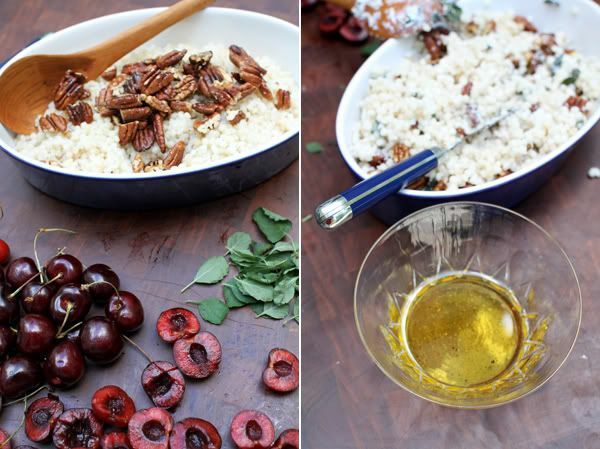 You rarely see recipes for cherries that don't involve the word crumble or pie, but I wasn't in the mood for something sweet and preferred instead to have the cherries as an accent to other ingredients. 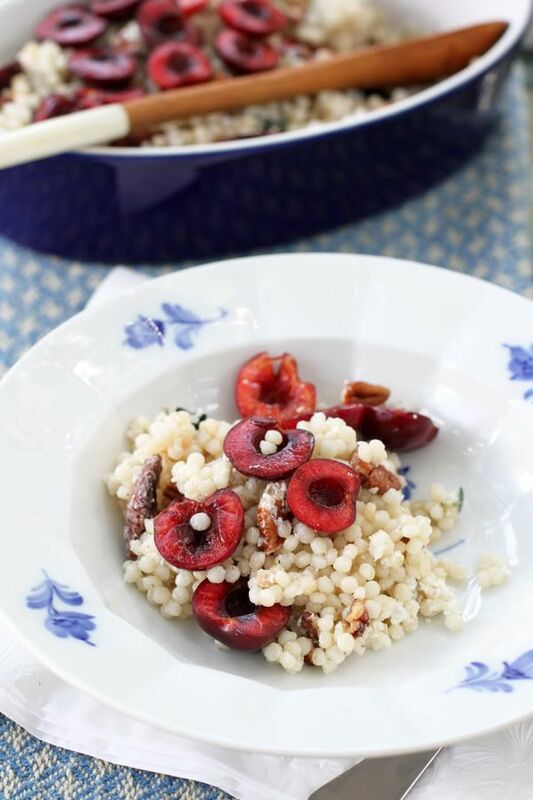 I thought about what might taste good with cherries - goat cheese, toasted pecans and mint sprung to mind and so I mixed them all together with some pearled cous cous for a yummy summer salad. Cherries also make me think of Zürich. When I left they were everywhere, all different colors and varieties. Zach and I are heading to Zermatt this weekend and I can assure you there will be a bag of cherries in our backpack along with the usual suspects - a loaf of bread and Boursin cheese. Delish! This recipe is also being featured on My Girlfriend Guide to Zürich. Angelica and Deja say the cherries are still overflowing out of the markets so I'm hoping the same is still true when I get back on Thursday! There are only a few ingredients in this recipe and they come together easily and quickly. Preheat the oven to 350F. 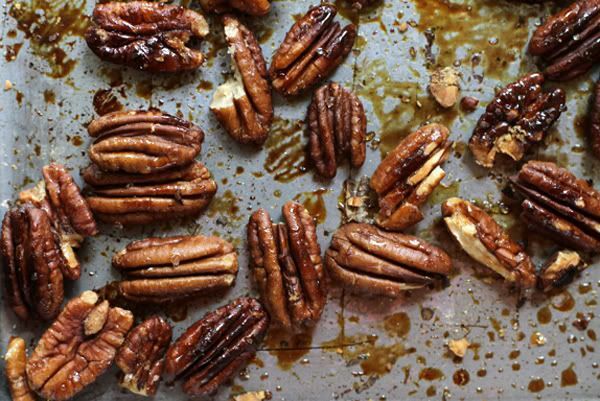 Prep the pecans by mixing in a baking dish or sheet with the maple syrup/sugar and salt. Stir to coat. Place in the oven until lightly toasted, about 7-10 minutes. While the pecans are baking cook the cous cous per the instructions on the box. Once cooked place in a strainer and run water over it to remove excess starch. You want the cous cous to be as loose as possible. 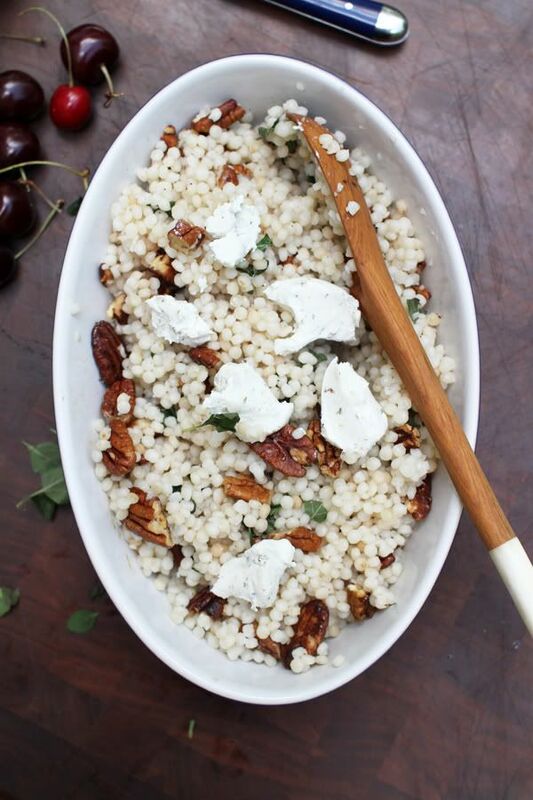 When the cous cous is done mix in the pecans (you can chop them a bit,) goat cheese, mint and salt and pepper to taste. 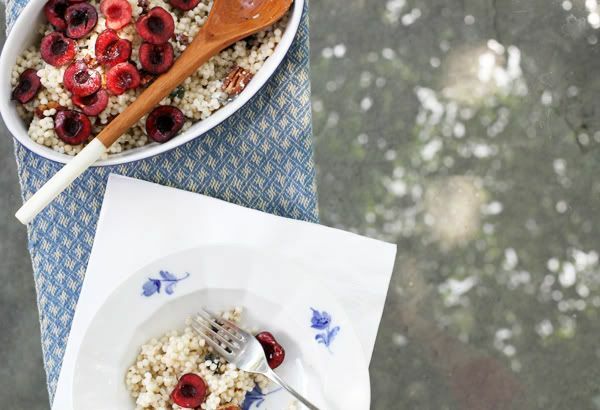 You will want a bit of dressing to keep the cous cous loose so mix the olive oil and red wine vinegar with a bit of salt and pepper until well combined and then slowly mix into the cous cous. You might not want to use it all, so add it to taste. Once the dressing is mixed in taste again and season with salt and pepper if needed. 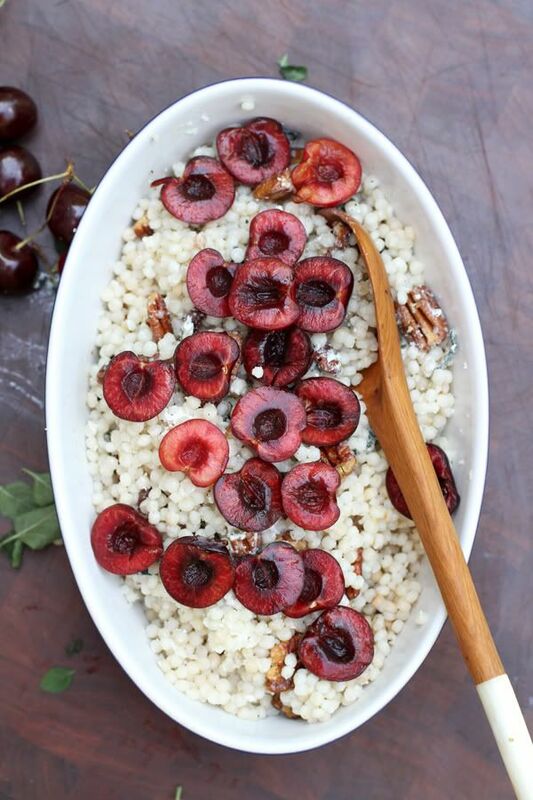 Once dressed and seasoned top with the sliced cherries and serve! 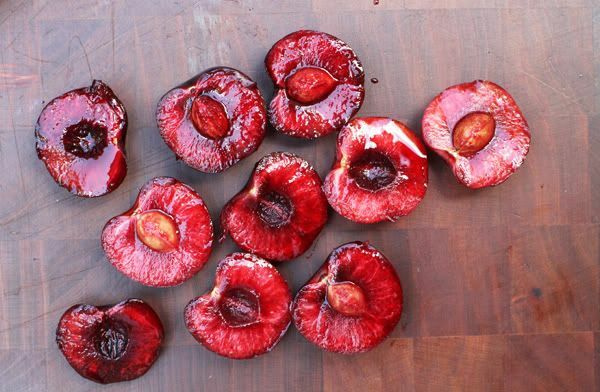 Makes a wonderful side to any summer dish. My parents kitchen in Connecticut, where I am currently living during my visa-limbo, isn't great for photographs because it's too dark. I have to take everything outside if I want good photos of it, which means I'm having a lot of personal picnics! I'm looking forward to heading back to Zürich on Wednesday, although I'll only be there for less than a week. I have to come back again in order to save up days for the few weeks in August when Zach's entire family will be in Zürich/Northern Italy. Of course I can't complain about my time at home - it's been great! Full of trips to NYC and visits with friends. This past weekend on 'the shore' was amazing, packed with delicious meals and american coffee, paddle boarding, and a lot of relaxing beach time. The gluten free banana bread was a huge hit! The two loaves were completely gone by the time we left. I wonder what it feels like to live without pizza...but I hear there are some really good gluten free pizza spots in the city...NYC has everything. Hello, I'm a reader in Zurich. When in Zermatt, take the lift to Schwartzsee and have some Roesti as you face the awesome Matterhorn. That is if it's clear, and I pray it will be :-) We were just there on the 8-10th for the marathon. My husband competed - just had to brag a bit here - and sadly we only got partial glimpses of that amazing mountain. But even if that's the case, the hikes are still amazing -- we walked to Zmutt on an earlier trip and loved it. Enjoy! 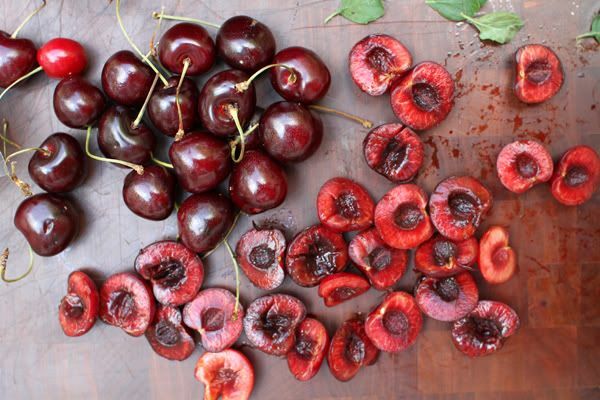 Oh, and these cherries look amazing. Susan, thank you so much for you suggestions! We'd do anything for roesti, so a roesti that is accompanied by a view of the Matterhorn is a sure thing! My fingers are crossed for good weather and a clear view. I hope your husband's marathon didn't involve too many steep hills - marathons are definitely worth bragging about! 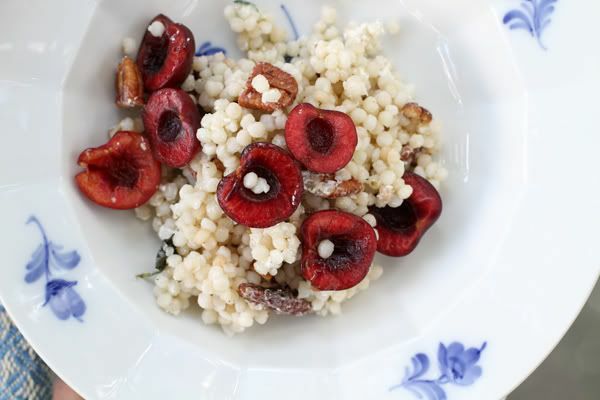 Talley, this looks delicious and incorporates two of my favorite ingredients - pearl couscous and cherries. I can't wait to make this. I can sympathize with your photography situation... my kitchen is dark and we live in a loft so there is no outdoor space - it is brutal! Talley, you are fabulous and I am so excited to read your blog! Such a pleasure meeting you this weekend on our bike ride and I truly hope to see you again soon. Your blog is absolutely beautiful and I love your photos and content. I can't wait to read more of your posts....Keep me posted when you are back in the states as I'd love to see you. Have a great day and looking forward to keep in touch. So happy we met! This looks delicious! So glad to have found your beautiful blog! I feel your pain with the bad light in your kitchen - we just recently moved and the the house is so heavily shaded that I have very slight windows during the day to take photos for our blog - does not bode well for a busy life!